Filtering is an essential part of any signal processing. In many cases only FIR digital filters are preferable since only FIRs with symmetrical impulse response may have exactly linear phase response. Linear phase response is very important for video signal processing. Some video applications require filters with very steep rolloff and high stopband attenuation. The steep rolloff and attenuation are defined by the filter length and coefficient precision. Sometimes to reach the required steep rolloff and high attenuation level, high precision coefficients (and therefore high precision multiplications) are required. It means that the complexity of the filter is high. 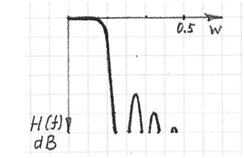 To resolve the issue, a cascade connection of two or more identical filters is proposed. Each filter in the cascade connection has a much smaller filter length, less precise coefficients, shallower rolloff and much less stopband attenuation. 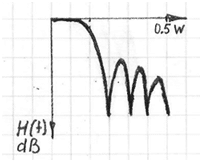 The frequency response of the cascade connection has stopband attenuation n·H(w) (in dB), where n is the number of stages in the cascade connection and H(w) is the frequency response of one cascade. Another advantage of this approach is that it is possible to implement only one stage physically in hardware, and then overclock it n times.